He had just arrived in Congress. It was his first vote as a senator from Rhode Island. His dad had died in office. Chafee ticked them all off during the Democratic presidential debate on Tuesday night when asked to explain his 1999 vote repealing the law known as Glass-Steagall. Vermont Senator Bernie Sanders says the measure enacted in 2008 to bail out investment banks did not go far enough. His comments came during the first Democratic presidential debate Tuesday night. Hillary Rodham Clinton says she supports continued monitoring of the banks under current law, but she sympathizes with the anger at bank officials. Former Secretary of State Hillary Clinton says she would “take more of a leadership position'' and stand up to Russian President Vladimir Putin over Syria. Asked during the Democratic debate on Tuesday night about Russia's increasing involvement in the Syrian civil war, Clinton says she would take a harder line against Putin. She says, “we have to stand up to his bullying'' and ``make clear'' that Russia has to be part of the solution. Clinton's comments were her first criticism during the debate of her former boss, President Barack Obama. 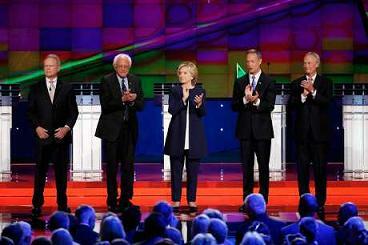 When it comes to climate change, former Virginia Senator Jim Webb was the odd man out on the Democratic debate stage on Tuesday night. Webb says he backs an “all of the above energy policy'' _ including coal, nuclear and the construction of the Keystone XL pipeline. Asked about climate change, Webb stresses the role China and India play and says the issue must be addressed as a global problem. Webb's competitors are promising more aggressive action on climate change. Former Maryland governor Martin O'Malley says his first executive order would set a target for a 100 percent clean electric grid by 2050. 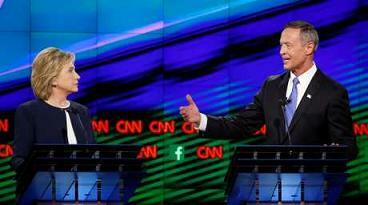 Maryland Governor Martin O'Malley (right) is the first to say in the debate on Tuesday night aired on CNN that another Clinton in the White House is one too many. It's a question the Republicans also face, with Jeb Bush _ the son and brother of former presidents _ also seeking the White House. Hillary Clinton and Maryland Governor Martin O'Malley agree that Edward Snowden, who exposed widespread National Security Agency surveillance programs and fled to Russia, could have been protected as a whistleblower but broke the law instead. 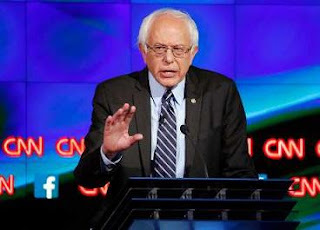 “Whistleblowers do not run to Russia,'' O'Malley, the former Maryland governor, said during the first Democratic debate on Tuesday night. Senator Bernie Sanders, grateful to Snowden for exposing what happened, says Snowden should get a break for educating the public. But he agrees Snowden should be penalized for breaking the law. As of January 2014, a CBS News poll showed 61 percent of Americans, including 64 percent of Democrats, thought Snowden should have to stand trial rather than be granted amnesty. Republican presidential front-runner Donald Trump isn't impressed by his Democratic rivals' performance during their first debate on Tuesday night, broadcast by CNN. The billionaire businessman and showman has been offering his commentary via Twitter. He describes the debate “a little sad!'' and says the candidates seemed too scripted and rehearsed. He has especially harsh words for the lower-polling candidates.